ARCHANGELS is a company based in God's Country (beautiful sunny Southern California), dealing in Rare and Unique Paper Collectibles. We specialize in vintage Comic Books, Original Comic Book Artwork, Hollywood Movie Posters and other related items as well. We are Senior Advisors to the Overstreet Comic Book Price Guide and a Charter Member Dealer with the Comics Guaranty, LLC (CGC). For other wonderful items, make sure to visit us at our About Me Page. All-Star Comics #58 Art by Ric Estrada and Wally Wood. This is a VERY COOL PIECE of artwork indeed. Original art for All-Star Comics #58 (DC, 1976) by Ric Estrada (pencils) and the legendary Wally Wood (inks). This key book was the first issue for the Bronze-Age re-launch of the classic Golden-Age title, All-Star Comics, which ended it's remarkable run in 1951 with issue #57. 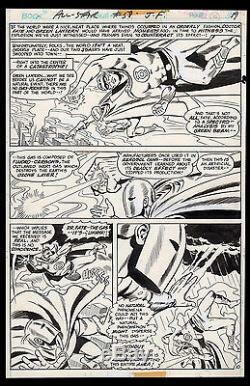 This four panel action page is simply superb in every aspect with outstanding multiple images of Doctor Fate and the Golden-Age Green Lantern (both being are in every panel with GL using his power ring) as the duo goes into full battle mode as they investigate a mysterious atmospheric disaster in Capetown, South Africa. Artwork featuring the Golden-Age Mage Doctor Fate is quite scarce, especially one with so many great images of him. Simply put, this is an absolutely sensational example of art, which features two of the greatest Golden-Age super-heroes of all time from a key Bronze-Age book with ink finishes by one of the most celebrated talents in the history of the medium. Artwork is in excellent condition with image size measuring approx. The item "All-Star Comics #58 Art by Ric Estrada and Wally Wood Doctor Fate Green Lantern" is in sale since Saturday, July 29, 2017. This item is in the category "Collectibles\Comics\Original Comic Art\Interior Pages". The seller is "water-walker" and is located in San Diego, California. This item can be shipped to North, South, or Latin America, all countries in Europe, Japan, Australia.